Spring canola yields have been strong in Ontario in the past two years, but are we meeting our yield potential? Are there ways to profitably increase yields? 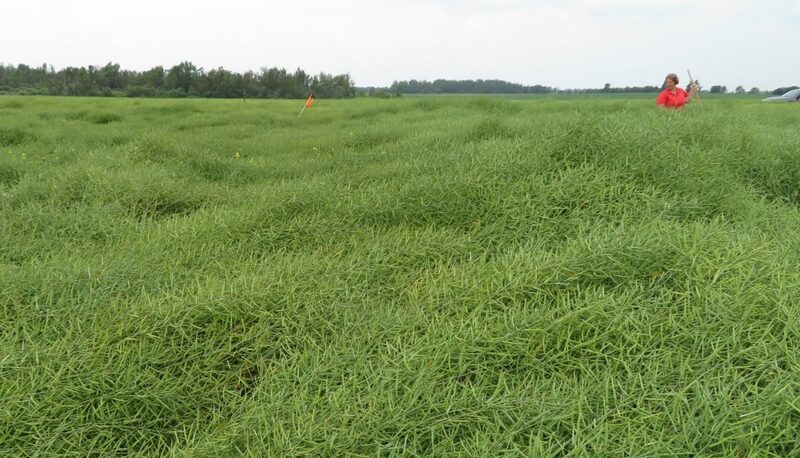 In 2017 a trial was conducted by Deb Campbell of Agronomy Advantage Inc. and Darcy Martin on Darcy’s farm in Kenilworth, Ontario to test and demonstrate management practices that maximize canola yields. Profitability comparisons were made across the various treatments. The trial was conducted at one site in one year, so further testing would be required to validate the results, but Campbell and Martin’s work demonstrates some management practices farmers can consider trying on their own farms. The trial was planted May 15, 2017 with the variety Bayer InVigor L233P. The field was chisel ploughed in the previous fall, and cultivated 2 times prior to planting. The various seeding rates were seeded in strips 40’ wide and 400’ long, with the planted and drilled strips alternating every 40’. Nitrogen was applied pre-plant at 110 lb/ac over the whole trial area. 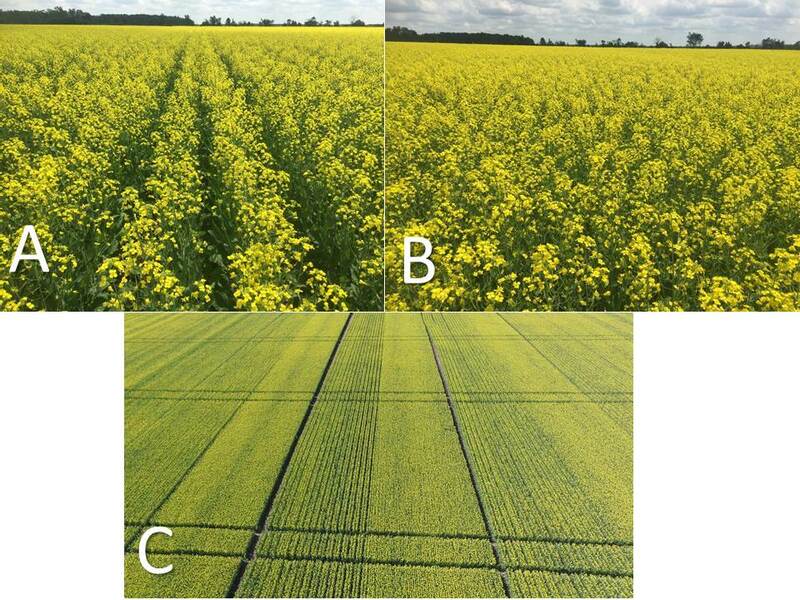 The three different in-crop nitrogen rates were applied across the plots, perpendicular to the direction of seeding (Figure 1). Plots that had nitrogen applied in-crop also received 2 passes with Proline foliar fungicide. Data was collected through the season on rate of emergence, plant height, branching, stalk diameter, lodging, white mould and yield. Figure 1. 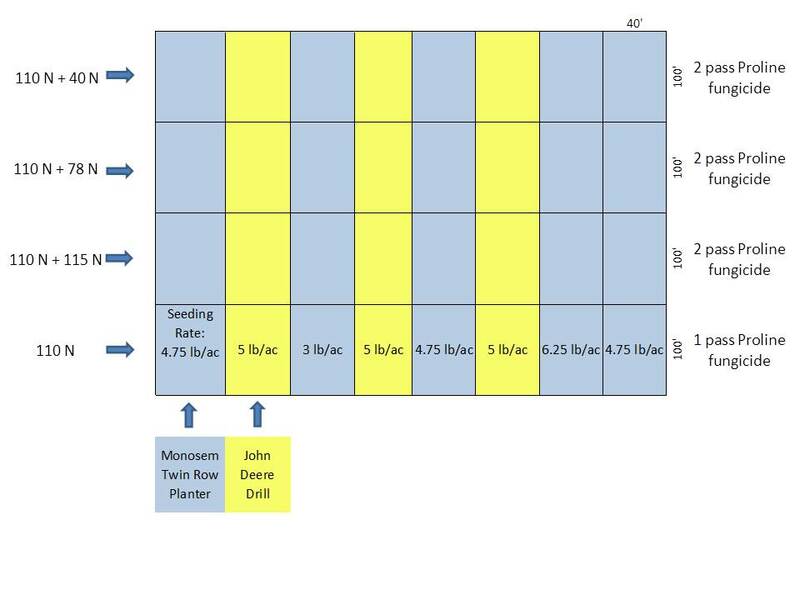 Canola agronomy trial layout. Seeding was conducted in the north-south direction, nitrogen and fungicide were applied east-west across the plots. Drilled plots (in yellow) were seeded at 5 lb/ac, and were replicated 3 times. Planted plots (in blue) seeded at 4.75 lb/ac were replicated 3 times; plots planted at 3 and 6.35 lb/ac were not replicated. 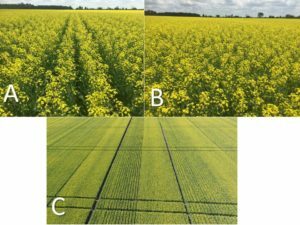 It is suspected that rates of nitrogen commonly applied in Ontario canola may not be high enough to support yield potential. Canola requires approximately 3-3.5 pounds of nitrogen per bushel of grain produced. The yield goal for this field was 75 bu/ac, so the highest nitrogen rate used in the trial (225 lb/ac) reflects the 3 lb N/bu requirement. The form of nitrogen used in the trial was Amidas, a homogenous granular fertilizer containing urea and ammonium sulfate (7:1 N to S ratio). During the season, some potassium deficiency was observed in tissue testing. Canola Emergence: Conditions were moist in the spring, leading to excellent rates of emergence. Nearly all plots, regardless of seeding rate or planting equipment, had approximately 100% emergence by 28 days after planting. In contrast, emergence rates in Ontario typically range from 60-75%. In the strip planted with 6.25 lb of seed/ac (not replicated) only 66% emergence was observed at 28 days after planting, indicating there may have been an error in seeding. At 8 days after planting, plots seeded with the Monosem planter had reached greater than 30% emergence, while those seeded with the drill had lower than 20% emergence. In addition, the final number of plants/ft2 ranged from 11.7 – 12.9 in the plots seeded at 4.75 lb/ac with the Monosem planter whereas plots seeded with the drill at 5 lb/ac had stands ranging from 12.4 – 17.4 plants/ft2. Although final plant stands were similar, the more precise placement of seed with the Monosem planter resulted in faster emergence and more consistent stands compared to the drill. Figure 2. Wider twin rows were visible through the season. A) Plots seeded with Monosem twin row planter on 30” centers. B) Plots seeded with a John Deere drill. C) Aerial view of the plots. Canopy Development: The twin rows planted on 30” centers did not fully close, and the wide rows were visible throughout the season (Figure 2). Lack of canopy closure may impact competition with weeds, although significant differences in weed density were not noted between plots. Significant differences in number of branches, stalk diameter and lodging were measured between the drilled and planted plots, likely due to the row width rather than the planting equipment itself. Wider rows resulted in thicker plant stalks and more branches. Drilled plots flowered 2-3 days earlier than planted plots. Planted plots showed a slight delay in maturity, as would be expected with more branching. Overall, differences in days to flowering and maturity between wide and narrow rows were small. However, the difference in stalk diameter, and the lodging resulting from thin stemmed plants, was more noticeable (Table 1). Drilled plots generally had a lot of thin stemmed plants and greater lodging (Figure 3). Table 1. Average lodging score for drilled and planted canola across 4 different nitrogen rates. Figure 3. The greater degree of lodging in the 3 strips of canola that were seeded with a drill was visible in aerial photos. Number of branches and stalk diameter were not significantly different across the various rates of nitrogen; however lodging increased as the rate of nitrogen increased, as expected (Table 1). An additional application of fungicide in plots that received in-crop nitrogen did not appear to mitigate lodging. Very low levels of white mould – the occasional dead plant – were observed across the whole trial, so it was concluded after the fact that the second fungicide pass was likely not needed for mould control. Yield Results: Plots were harvested with a Claas Lexion 750 with an auger head, an extended pan and knives on either side of the header. There were no significant differences in yield based on seeding rate. This is well documented in scientific literature; individual canola plants will branch out and yield more when populations are lower, and a stand can meet yield potential at populations ranging from 5 to 20 plants/ft2. In addition, the yield of plots seeded with the drill did not differ from planted plots. There were some statistically significant yield differences across nitrogen rates (Table 2). The plots with only 110 lb/ac of nitrogen applied pre-plant yielded lower than all other plots. There were no significant differences between yields at all other nitrogen rates. Unfortunately a treatment of 110 lb/ac of nitrogen split applied was not included for comparison to 110 lb/ac applied pre-plant, so the results do not indicate whether higher yields were achieved because of the higher amount of nitrogen or the timing of application. Table 2. Average canola yield by nitrogen rate. Yields were pooled for all drilled and planted plots at the same nitrogen rate. Yields followed by the same letter are not statistically different. The 15 Most Profitable Plots: The cost of inputs was tracked for each plot, and profitability calculated based on the yield within each plot. A general evaluation of profitability was conducted by looking at the 15 most profitable plots out of the 32 plots in the trial. Disregarding the cost of purchasing new planting equipment, there were no differences in profitability of planted vs drills plots in general. About half of the most profitable plots were seeded at 5 lb/ac using a drill, indicating this common practice has a place in our canola management. However, 3 of the plots that used a 3 lb/ac seeding rate were included in the 15 most profitable plots. The ability to lower seeding rates using a planter without lowering yield is an opportunity to lower input costs and increase profits. Of the 15 most profitable plots, 3 were fertilized with just 110 lb N/ac pre-plant and had only 1 application of fungicide. These plots represent some of the lowest input costs in the trial, and combined with decent yields this can provide good returns for producers. However, we know that additional nitrogen led to higher yields on average, and in many cases the additional yield was enough to pay for more nitrogen. Six of the 15 most profitable plots received 110+78 lb N/ac, and 4 received 110+115 lb N/ac. In this trial, plots with higher rates of nitrogen consistently yielded more and were more profitable than with lower rates. The general trend from trial results was that lower seeding rates and higher nitrogen rates improve profitability. However, it can be difficult in spring canola to find a balance between yield and profitability. The #1 most profitable plot was that with the lowest input cost, and the 2nd most profitable was the highest yielding plot. Future trials could include higher rates of nitrogen all applied pre-plant, and lower rates of nitrogen split applied to better evaluate the best nitrogen management strategy for canola. As a reminder, this data represents one trial at one location in 2017. Replication of this project would provide more confidence in the results. There is a very limited amount of research conducted on canola in Ontario and this project offers food for thought for Ontario farmers. The highest yield achieved in these field scale plots was 87 bu/ac, and there were two sets of tramp lines through the plot. The average spring canola yield for Ontario in 2017 was 48.8 bu/ac, so it appears there is opportunity to grow more profitable canola in the province. Have a yield goal in mind when planning for the season, and conduct trials on your own farm that include higher nitrogen rates and split applied nitrogen. The field trial was developed and conducted by Deb Campbell and Darcy Martin. 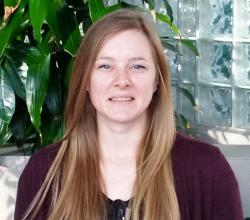 Data collection and analysis were supported by Meghan Moran, Tasha Valente and Ian McDonald. Ontario Canola Growers Association provided funding for the project.